It all started with a bacon sandwich, back in June. I'd gone out for breakfast in my local town, and being on my own for the day, popped into the newsagent to get myself something to read. 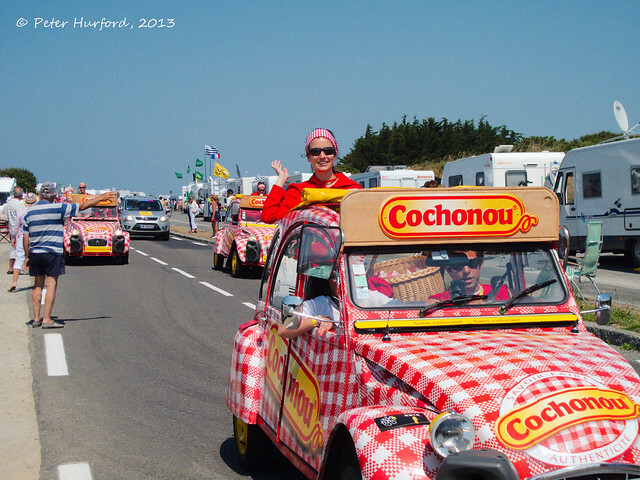 I spotted the Tour de France supplement and was sorted. Fast forward a month, to the evening of Monday 8th July. A rest day on the Tour, but a hive of activity at Portsmouth, where I am with-bike, waiting to board the ferry. Normally these ferries heave in the summer months, with Brits taking their families, cars and caravans over on holiday. You'll see cyclists too, in fact I've done it myself, but possibly only a handful on any one crossing. Tonight, however, was a little different. Over 100 bikes on the quayside, not to mention the cars with bikes on their racks. And flags, lots of flags. Union Jacks which show instantly the effect that Brailsford, Wiggins, Froome and Co (not to mention Sky's deep pockets) have had on raising the profile of cycling within the UK. Safely onto the ferry, with the crew liberally dispensing corrugated cardboard and bubble wrap, but never quite sure whether its to protect the bikes or the ship! A quick meal, then settling down for as good a night's sleep as possible on a reclining seat - the downside of booking so late. 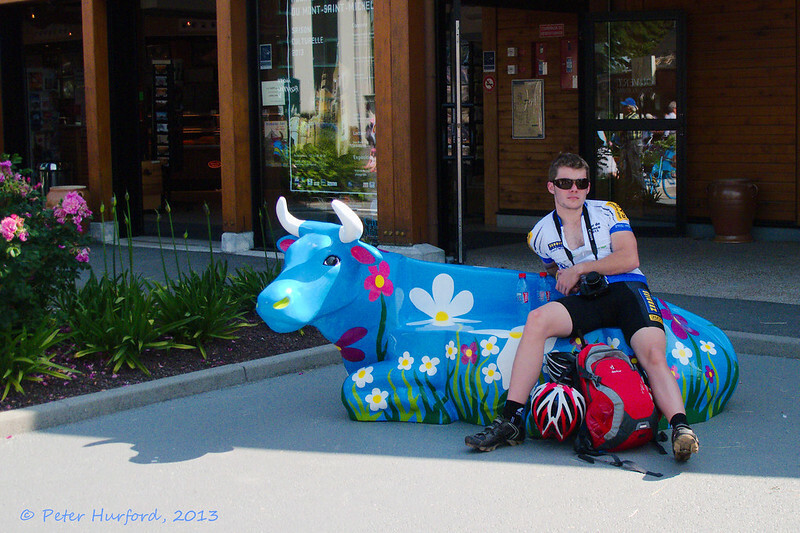 My «Tour de France» bike. 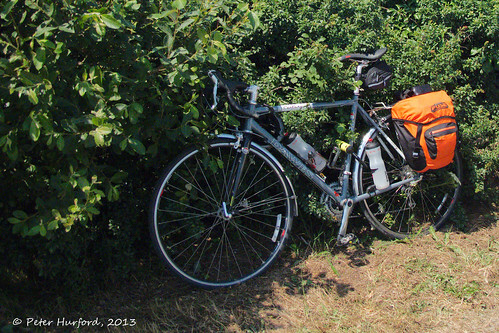 A Dawes Century SE Audax bike, a steel workhorse and the only one of my bikes capable of carrying luggage. "Luggage" comprised spare bibs, socks and jersey; lightweight trousers and shirt for evenings; tools; and finally my camera, phone and various chargers. First thing Tuesday, and I realise my first mistake. The heat we'd been enjoying in the UK was gone, replaced by grey cloud, and....cold! Unfortunately given my extremely limited storage, my only concession to cold was a pair of arm warmers. Still, on they went. Next thing, I'm in Saint-Malo at eight o'clock in the morning, and the Tour finish would not be until around five o'clock - I had time to kill. First things first - some petit dejourner. 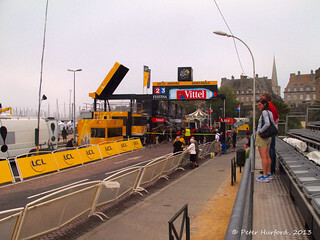 Set for the morning, I decided to explore Saint-Malo, and get my first glimpses of the monolith that is the Tour de France. The countless lorries containing pre-fabricated.....well.....everything. The barriers, the seating, even the podium, packed up every evening, driven to the next location, and set up once again the next morning. Complete chaos! 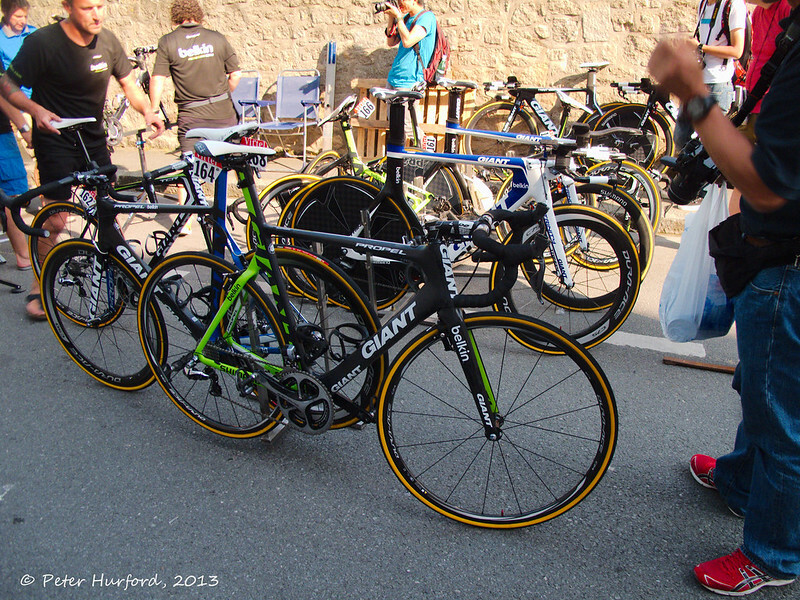 Having mooched around, watching the small army of workers set everything up (including stalls selling all kinds of merchandise, from yellow jerseys to team jerseys, much of which can be bought from the Tour's web site), it was time for action. 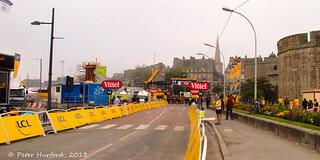 It was never my plan to stay at the Finish line - excited though I was by the prospect of a stage set perfectly for everyone's favourite sprinter (provided you're British! ), Mark Cavendish, I was too put off by the prospect of thousands of other people with the same idea, and also by the steadily growing number of VIP areas being set up (in all the best places), to which mere plebs had no access. 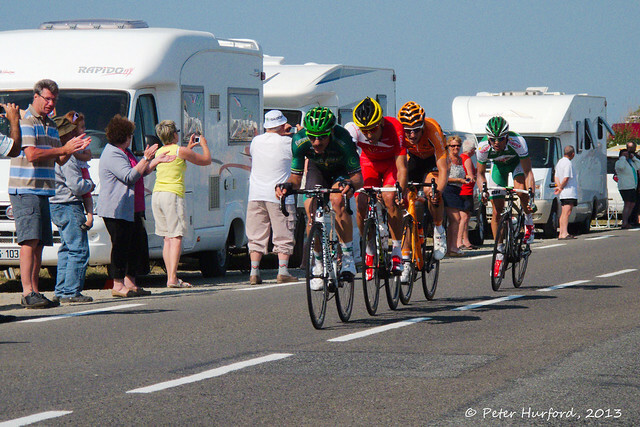 No, my plan was to see the race in a much more egalitarian location, outside of Saint-Malo, along the coast road, hopefully with a good backdrop for some photos. A short 15km ride, and I am in the seaside resort of Cancale, the clouds have dispersed and the day is warming nicely. The race will pass through here later, and the town is decked out. Alongside more cordoned-off VIP areas, some display events have been laid on with local kids, and the place is filling up nicely. A lovely place to chill for a few hours, culminating in lunch and even a catnap on the grass outside the town hall. Time to move on again, this time to my intended vantage point of the race. Out of Cancale, the race heads north along the coast to the Pointe du Grouin, where it then heads west into Saint-Malo. The Pointe du Grouin, that was the plan. Beautiful scenery, hopefully fewer people than in the towns, and quite a straight road so should have a good view of the riders who, this close to the finish, will be going at full speed. A short hop, just a 5km ride, and I'm at my destination and looking for a decent viewing spot. The D201 at the Pointe du Grouin. Not quite as quiet as I'd hoped for! 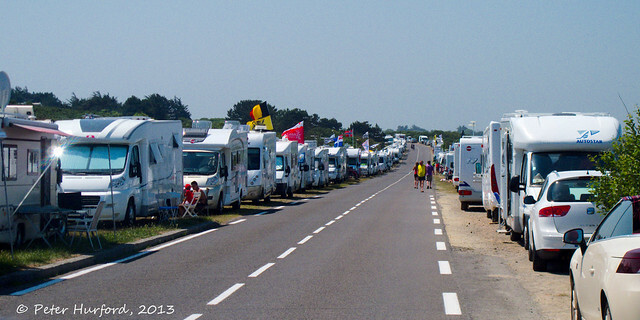 Now, the Caravane really is the spectacle in the Tour de France. 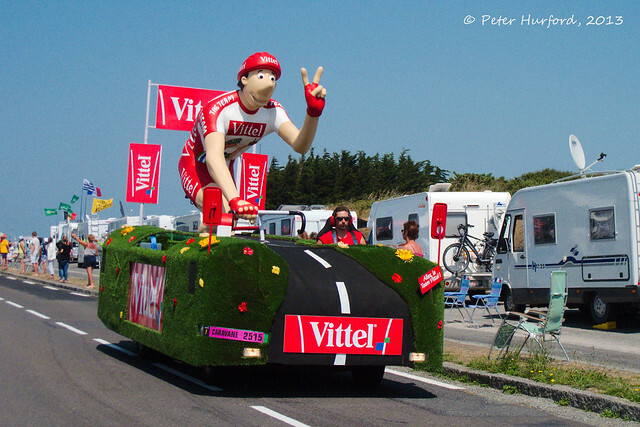 As far as I am aware it is unique, doesn't happen in either the Giro or the Vuelta, although I could be wrong. An array of floats representing various tour sponsors, and a superb opportunity to grab freebies as they are thrown from the floats. Great for little kids. Great for not so little kids!! And the freebies? Well, it must be said they are mostly crap: caps, keyrings, wristbands, candy, fabric conditioner(? 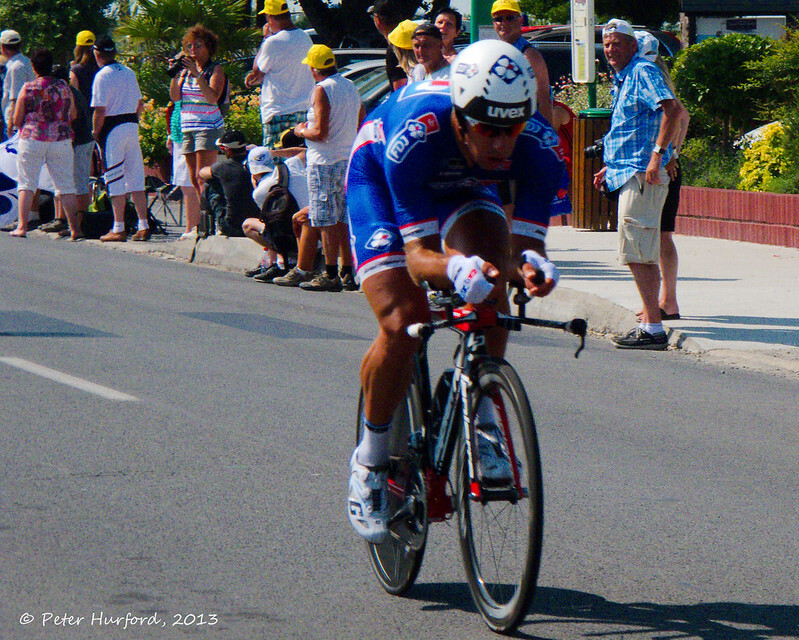 ), plus those enormous green hands that you see at the finish lines on TV. But they do represent real souvenirs that simply cannot be bought (well, except a few days later on eBay!). And positioning here is key, every bit as much as the race. That eight-year-old kid standing next to you is your rival - when the time comes, it's him or you! Well, that's the theory in any case. In practise, they basically end up throwing everything to the guy next to you, the guy who'd rocked up just 5 minutes ago while you've been waiting over an hour, the guy whose physique clearly demonstrates that its been several decades since he was anywhere near a bicycle (even picking his goodies off the floor looked like an effort for him)..... But let's not be bitter. Sure, it was hot and a cap would have been great to counter the heat (I still had my lid on and had visions of my head being striped pink-and-white by the day's end!). Also, this would have kept me in my wife's good books - this was the one souvenir she'd specifically asked for). But I kept telling myself, the really memorable part is the glitz of the parade itself. 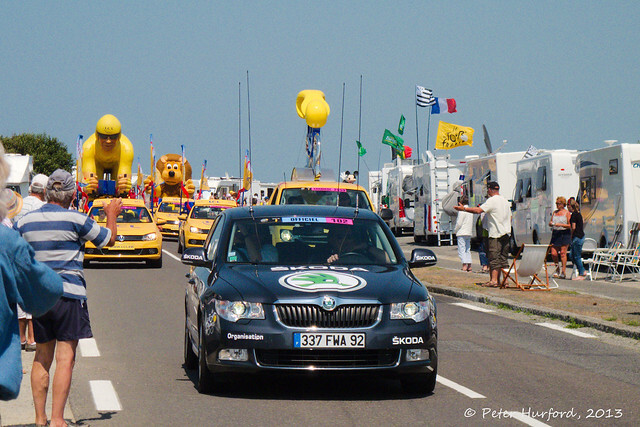 So the caravane is out of the way, next up is the race itself. And the funny thing is, you're never quite sure when its coming. There is of course race radio - in the towns there are PA systems which will relay this, and on the road there are truck-based sound systems, but these trucks are few and far between so you're not in constant contact. Besides, this information is relayed exclusively in French, so you're immediately limited by your vocabulary. And as with most live sport, you're there for the atmosphere and never get the full picture that we've become used to seeing on TV. No, out in the countryside, the first inkling that the Tour is coming soon is the buzzing of the helicopters - when they start appearing, the riders are coming. And then, WHAM, the vehicles and riders come into sight. You cheer, you snap. In our case, there was a breakaway of four riders but they were only seconds ahead of the peloton and about to be reeled in. 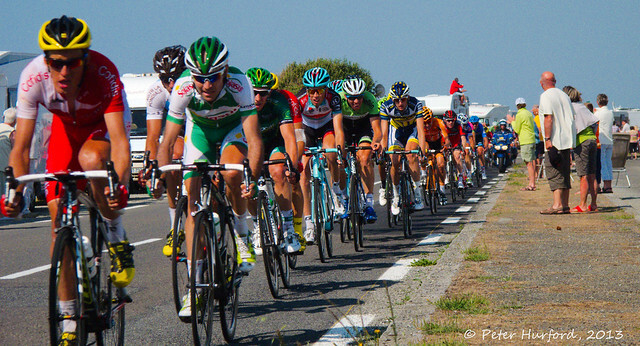 (I reckon I'd ridden another 1km beyond the 20km marker from Cancale, so that would put me at 19km out.) In realtime, its almost a blur - they're doing more than 50km/h at this point. And then, no more than fifteen seconds later, its over. After almost three hours wait! For many Brits, that was their Tour. The ferry company had laid on a special overnight crossing back to the UK, and these guys would be back at work tomorrow, albeit a little worse for wear. I was lucky, however, I'd booked an hotel for a couple of nights so I could see the next stage too. So I was headed back to Saint-Malo as well, but for a different reason. A beautiful ride back, and along the very road that the race had just been along. And of course, here the bike came into its own, zooming past the instant traffic jam that had just formed. 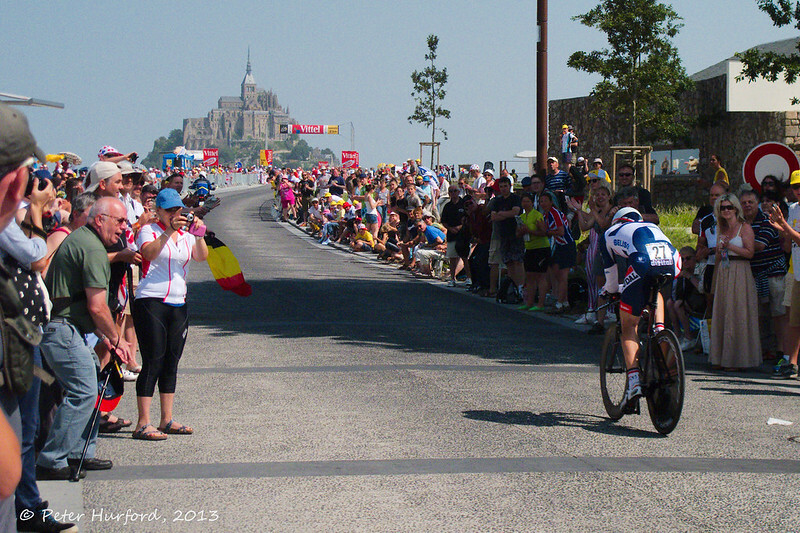 The next stage was a time trial, finishing at the Mont-Saint-Michel, around 50km from the hotel. Furthermore, because of my truly pathetic haul of goodies from the previous day's caravane, I wanted a second bite at the cherry. That would mean covering those 50km and arriving by around 9:30am, so I had an early start. A beautiful ride, for a large part along the edge of the bay, and I arrived nicely in time to park up and await the caravane among the growing crowds. But if I was hoping for better luck today, I was to be disappointed. True, I got a couple of things, but mostly candy that I gave away to the family standing beside me. But still no cap, it looked my wife was going to be disappointed. Very shortly afterwards the first rider came through, so soon that nobody was really expecting him. 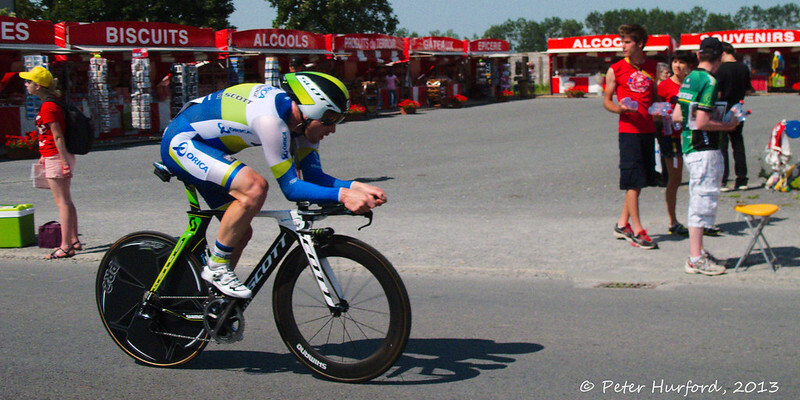 But it highlighted the chalk-and-cheese difference between a time trial and a normal stage. The normal stage builds up the excitement, then....bang, its over in an instant. The time trial however is more of a controlled affair, so much so that there is time to go get a drink or a snack, or look at some of the stalls selling Tour merchandise, or head down the road to see if the view is better there, or have a lie down, or experiment by taking a movie rather than stills..... And if you happen to miss a rider? Well, so what? There'll be another one along in a couple of minutes! 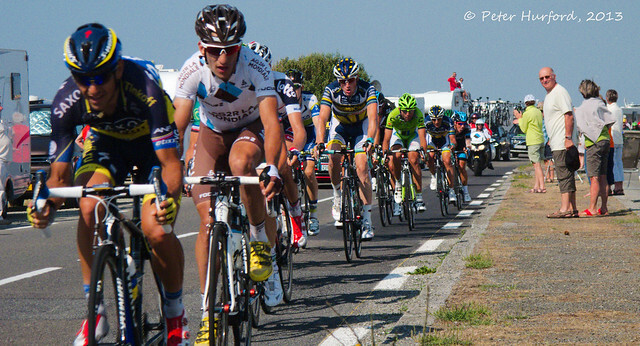 but, certainly in terms of the photographs that I took, the highlight for me was a (pure fluke) shot of World Champion, and eventual winner of the stage, Tony Martin, in all his glory. I didn't even realise I had this shot until I got home. By this time I had long since bitten the bullet and bought myself a cap to ward off sunstroke - at €20 each for two caps (I couldn't let my wife down!) and another €30 for a t-shirt, these were quite hefty treats. 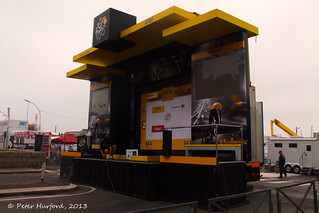 The Tour de France promotes itself quite heavily as a "free" event, and strictly speaking it is, but the range and prices of the peripheral merchandise do give some idea of at least one source of income. By 3 o'clock the heat was such that I'd had enough. 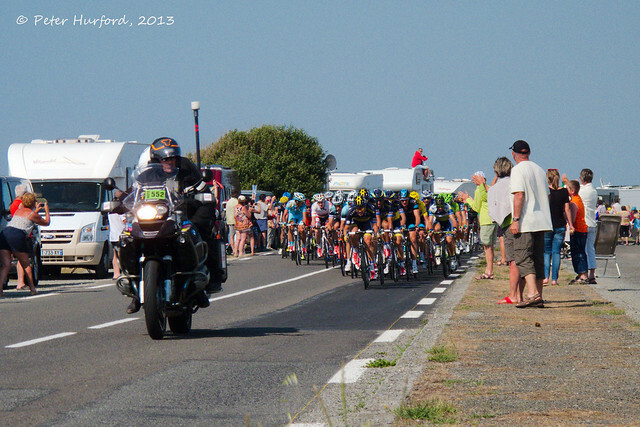 Deciding to watch Froome, Contador and Co another day, it was time for me to head back. In theory, I'd given myself enough time to get back to the hotel and see the last few riders on TV, but it was a far more pleasant alternative to meander back through the countryside, via the lovely town of Dol-de-Bretagne, taking time out to refuel with some ice-cold Orangina along the way. 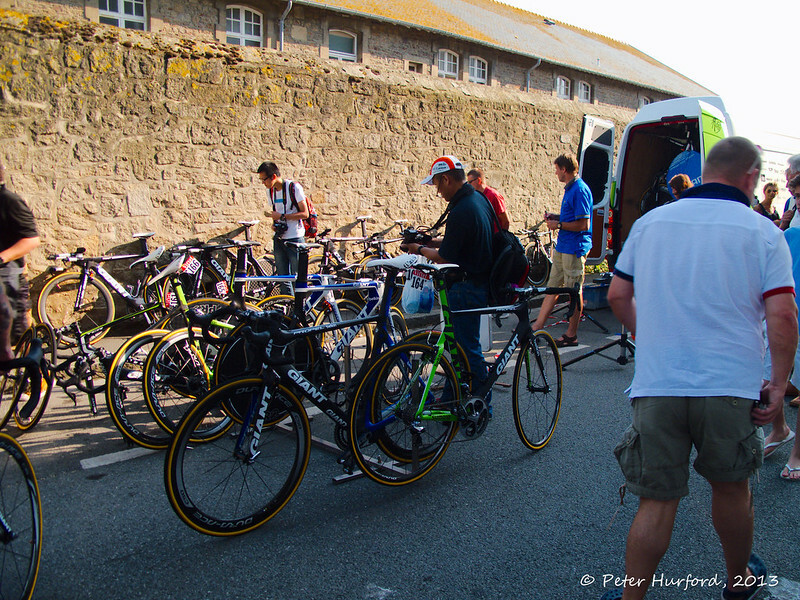 Back to the hotel, where Team Belkin were still present. 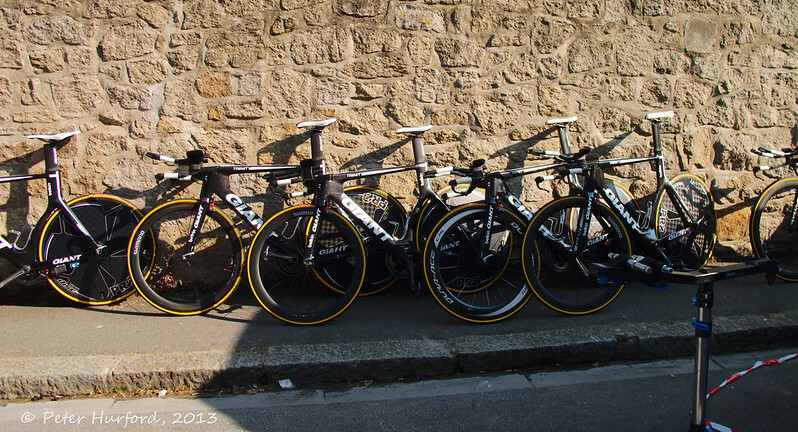 This surprised me because the next day's start was in Fougeres, 100km from Saint-Malo. I'd have thought they'd keep their morning travel times to a minimum, but I suppose a with the amount of shuttling from one place to another, the opportunity to stay in one place for a few nights must seem like a bonus. 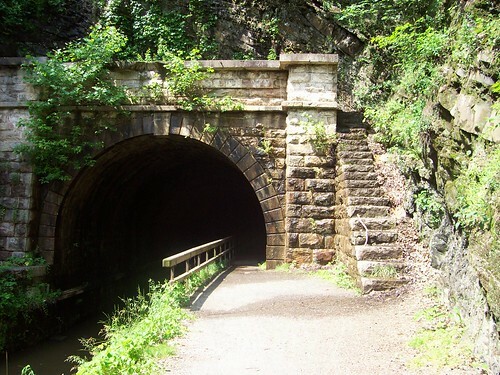 The C&O runs 180 miles along the Potomac river from Cumberland, MD to Washington, DC. The surface is mostly packed dirt. 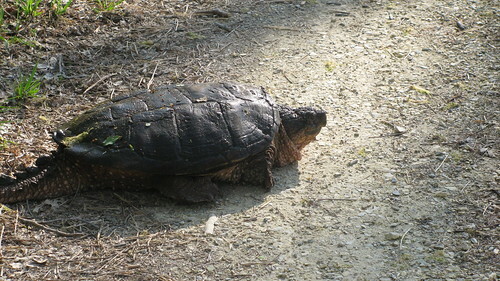 You don't want to ride this one with skinny road tires. I managed with 700x32 standard touring tires, but riding here is more fun with knobby tires. 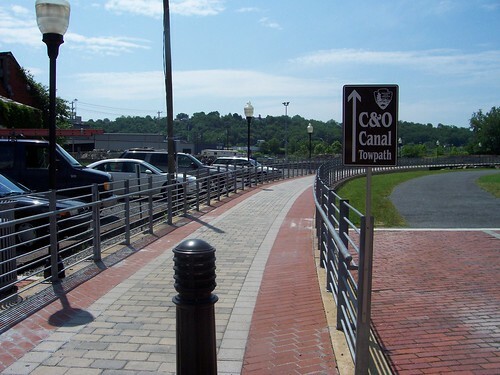 It's worth noting that the C&O meets up with the GAP trail in Cumberland, which takes you pretty much all the way to Pittsburgh, PA. The two trails are popular touring destinations. If you're starting in Cumberland, check out the Cumberland Trail Connection, a bike shop that has catered to trail users for years. Once you exit town, it quickly turns into the dirt trail it will be for most of its way to the nation's capitol. You'll ride through fields, past pastures and horse farms, and through woods. If it's rained recently, you'll also get pretty filthy. I highly recommend fenders on this trail. 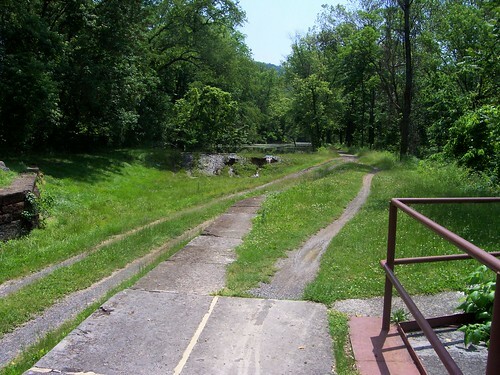 When I went on the northern half of the C&O, portions of it were very overgrown. However, they've since tamed the path a bit, which I think is a shame. Bring lights along; there are a few unlit tunnels where you'll need them. 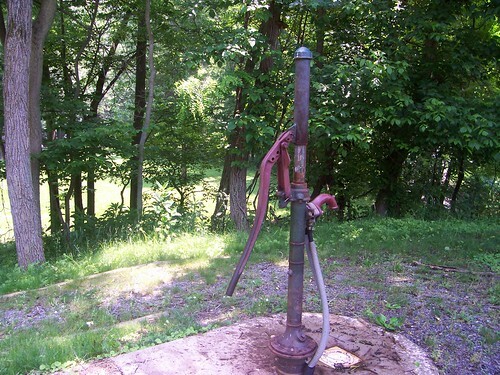 Most water available along the trail is from cisterns, and is treated with iodine. If you'll be on the trail for more than a few hours, check the status of these with the park service. Getting stranded overnight without water is, as I can testify, no fun. 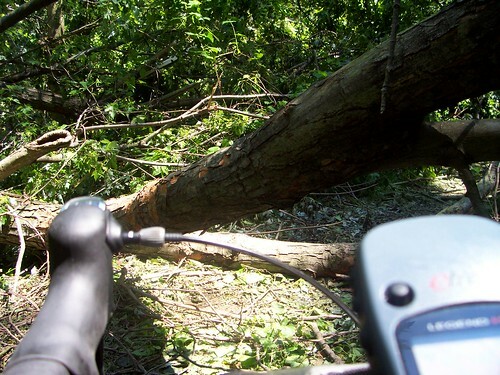 Fallen tree, about four hours south/east from Williamsport. I had to take an on-road detour, and I was glad I had a GPS for that bit. 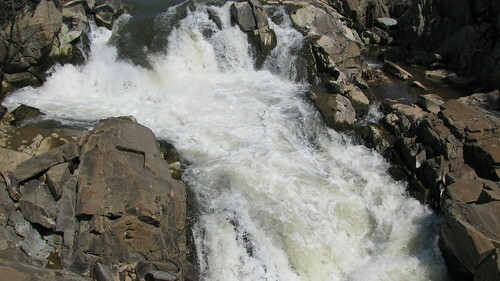 If you have time, stop and see the Great Falls. 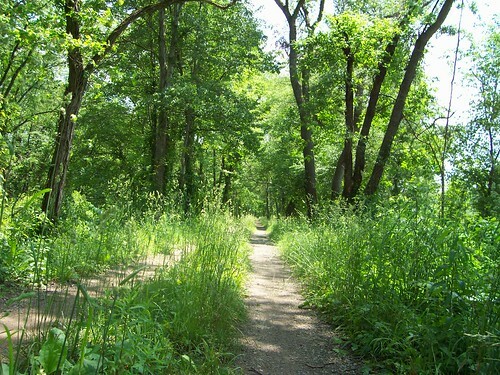 It's right off the trail itself, and maybe an hour or two from the end of the trail in DC. I found it breathtaking, and well worth spending a couple of hours. After some other fiddly maintenance, I put the bike against the wall, in preparation for the morning commute on the towpath. A few hours layer, I hear a loud bang! Loud enough to be a balloon popping next to my ears, or maybe a gunshot from fifty yards away. 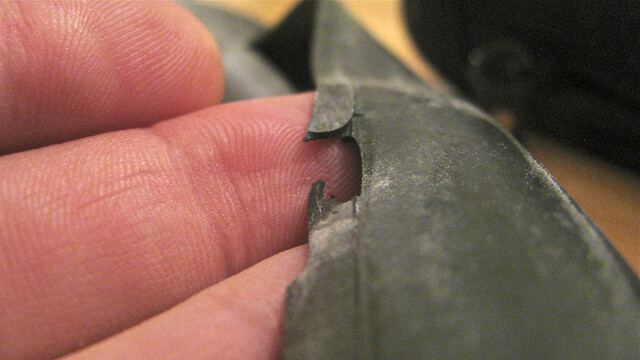 The front tire had exploded, and the bike was standing there with the tire half-off the rim, the tube in shreds. The guitars I have hanging on the walls were ringing, as were my ears. Secondly, replace your tires before three years pass; the tread on those was pretty low, the sidewalls almost gone. There's good advice in this question about tight tires. I can't believe I forgot the talc trick! I'll try it in the morning when I replace the tube. Aside from Bicycles.SE, these are the sites related to Bicycle touring I like the most. 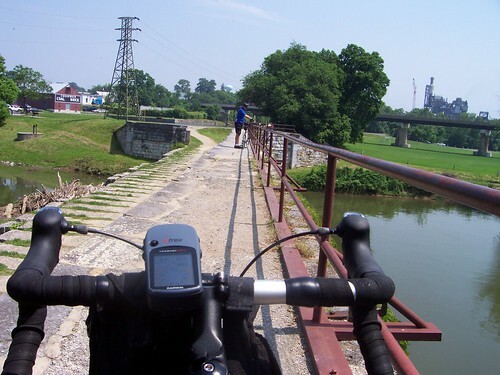 Crazy Guy on a Bike is home to the largest collection of bike touring journals on the planet. Many of them are worth reading, and some of them are excellent. The site started out as simply a place for site owner Neil Gunton's journal, and is now home to nearly 6,000 journals (including twenty of mine). This one about a Florida-to-Washington tour is my current favorite. The forums there are also quite good. The Touring Store is my favorite place to buy racks and panniers and other bike luggage. The proprietor is extremely knowledgable about his merchandise, and genuinely wants his customers to be happy with their purchases--and also for them to buy the right stuff in the first place. The Touring subforum at BikeForums is also a very good resource. I've found many of the people there to be a good source of information, and sometimes to be very inspiring. Warm Showers is a shared hospitality site for bike tourists, similar to Couch Surfing. Icebike hasn't been updated in years, but the site still has a lot of great information. I've consulted it when planning winter tours. Can anyone recommend any other really top-shelf sites that should be here?